Surrender to Holy Love, which is the two great commandments of love. Entrance into the Sacred Heart of Jesus (Divine Love) through deeper surrender to love. Soul begins to equate Holy and Divine Love with the Divine Will of God. He aspires to personal holiness by greater surrender to God’s Will, which is always Holy Love in the present moment. He begins to understand that his will is directed by what he holds in his heart. The soul, now rooted in Holy and Divine Love, puts all his effort into being perfected in the virtues. He practices the virtues diligently, prays for them in his soul, and when God sees a worthy effort, He infuses the soul with these virtues. 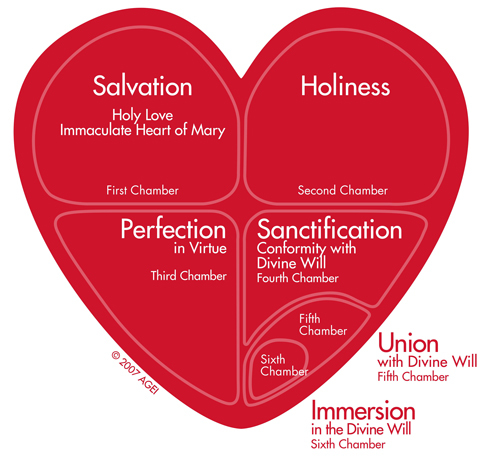 This Chamber of Jesus’ Divine Heart embraces those who have successfully conformed to the Divine Will of God. There are still two entities: the soul who continually seeks conformity and is successful in this; and the Divine Will of God. Step 5: Union with the Divine Will. Few reach this inner sanctum of Our Lord’s Heart. There is now only one entity. Self is no longer present. The soul is one with God and His Divine Will. This is the New Jerusalem. Step 6: Immersion in the Divine Will. In January and February of 2001, Jesus dictated the following series of messages to the visionary, Maureen Sweeney-Kyle, in which He revealed the “secrets” of the five Chambers of the United Hearts. The revelation of a Sixth Chamber – the Heart of God the Father – the Highest Heaven – began in April of 2003.